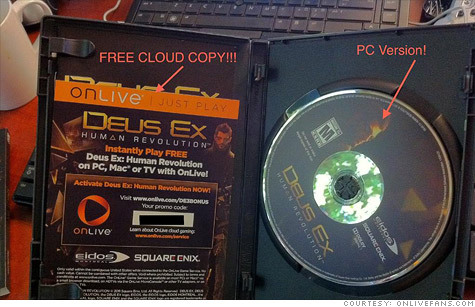 Fan site OnLiveFans.com touted the free online version offered with Deus Ex: Human Revolution -- but GameStop stripped the coupons out of copies sold in its stores. NEW YORK (CNNMoney) -- Video game retailer GameStop is under fire for opening boxes of the just-released PC game Deus Ex: Human Revolution and removing a coupon from the publisher that would have given buyers a free copy of the game's online version. Square Enix, which publishes DXHR (as the fans call it), announced the launch promotion on Tuesday. The coupon code was meant to give all buyers free access to the game on OnLive, a Web-based platform that enables gameplay on TVs, computers and, soon, on tablets. OnLive's cloud-based version of the game is priced at $49.99, the same price as a physical copy. But on Wednesday, the blog GameSpy posted a story saying it had received complaints from consumers claiming their new DXHR boxes were opened and the OnLive codes were missing. The article also included a photo of an e-mail sent by GameStop management instructing employees to "immediately remove and discard" the coupon. GameStop -- which also sells its own digital version of DXHR -- views OnLive as a rival. GameStop (GME, Fortune 500) spokesman Matt Hodges confirmed the coupon-clipping to CNNMoney. "Square Enix packed a competitor's coupon within the PC version of the game without our knowledge or consent and therefore we did pull these coupons," Hodges said in an e-mail. "GameStop's policy is that we do not promote competitive services without a formal partnership." Square Enix declined to comment. After the news broke, message board commenters on an OnLive fan site began speculating about the legality of breaking a game box's seal and selling it as new. "The big issue here is that if GS is allowed to get away with this, what's to stop other retailers from doing the same thing[?]" wrote commenter Punkduck2064. "What if Amazon and Walmart removed the digital copy codes from the DVDs [they sold] simply because their competitors were the ones providing the digital copy." GameStop initially stood by its approach, saying in a prepared statement that while game boxes "may have been opened to remove the coupon, we fully guarantee the condition of the disc to be new." But late Thursday, company spokesman Hodges said GameStop had changed its policy after talking with Square Enix. Now, GameStop says it will not sell the opened DXHR packages -- in fact, it won't sell any physical copies of the game at all until Square Enix ships GameStop a version without the OnLive coupon. GameSpot will continue to sell its own digital version of the game in its stores and online. Put on your 5-D glasses!